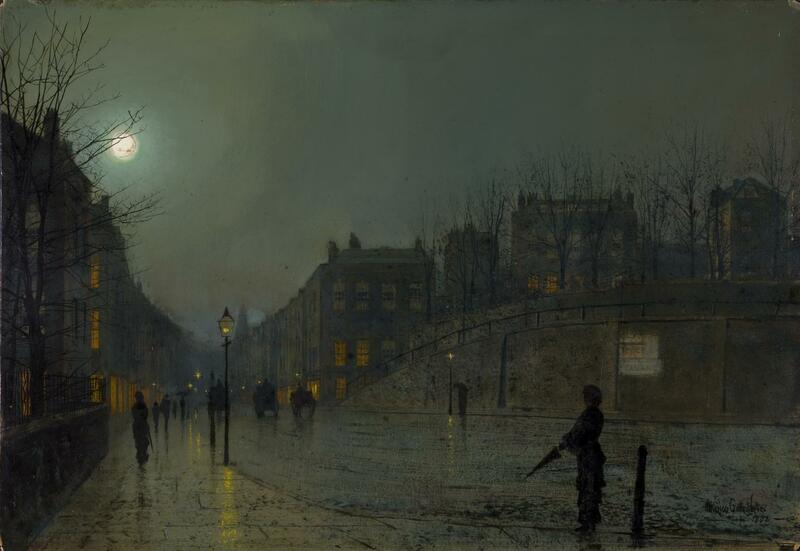 John Atkinson Grimshaw is the painter of the industrialised late Victorian Britain who captured the beauty of wet pavements, rainy cobble streets, gas lamps, hustle of carriages, grey facades and docs under moonlight. His romanticised portrayals of urban cities still possess a slight dose of dreariness, a mood of a cold and gloomy night of November when everything is damp, wet and mist descends. In his painting ‘Shipping on the Clyde’, Grimshaw perfectly captured the atmosphere of a cold and gloomy November twilight. Beautiful night sky that seems to have been woven from teal and sea foam shades of blue and green stretches above the docs of Glasgow, carriages are passing, wet pavements are glistening on the light of gas lamps, vivid sulfate yellow shines through the shop windows, and occasional figures that ventured into this damp night are opening their umbrellas and leaving in a hurry. All of his paintings have an intoxicating nocturnal beauty about them, but I’d dare say this one is my favourite. Grimshaw is the master of moonlight scenes, portraying cold and wet Autumn eves, and nocturnal townscapes in a style that combines realism and romanticism at once. 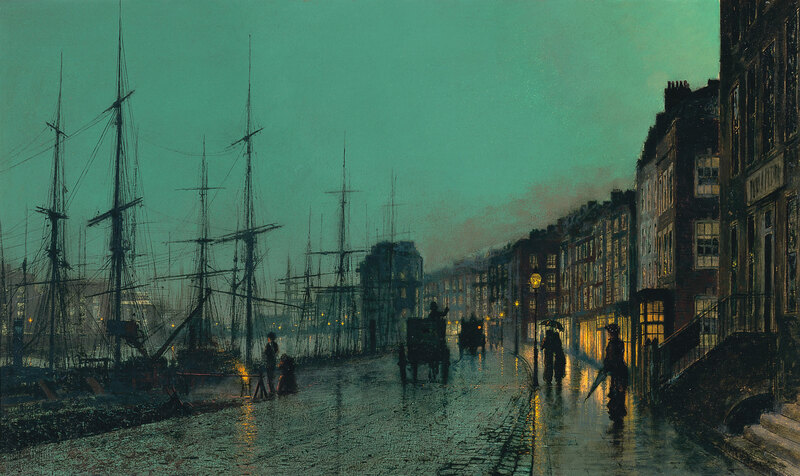 Subject of his art are mostly grim cities of the North; Glasgow, Leeds and Liverpool, whose landscapes had been greatly changed as a result of the Industrial revolution. 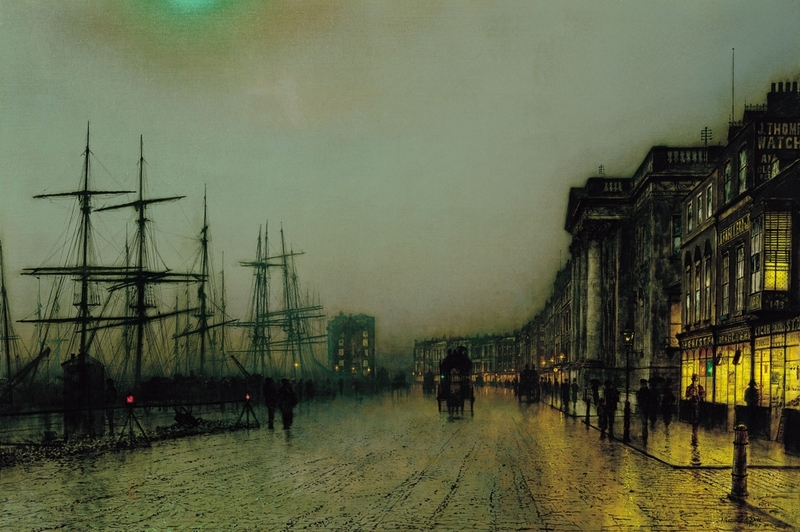 Some might perceive the appearance of these modern cities as dehumanising, cold and dangerous, but Grimshaw saw a certain beauty in moonlit nights over the docs, grey facades with large and luminous shop windows, damp days and misty mornings, and wet cobble streets of the North. Grimshaw’s townscenes are charmingly lyrical because he portrayed them in a romanticised way, ignoring the dirty and depressive aspects of a late Victorian city; dirt, prostitutes, poor children, thieves, bad working conditions, smog, tall chimneys of many factories. Same bleak industrial landscape would later inspire a string of Northern bands, most notably Joy Division. Their guitarist, Bernard Sumner admitted he found Manchester ugly, adding: ‘I don’t think I saw a tree until I was about nine.’ Their song ‘Exercise One‘ has a specially brooding, grim sound which is a pure product of the grey concrete wasteland that surrounded them. Still, Grimshaw’s way of presenting things reminds me more of The Smiths; while Morrissey sang of loneliness and feeling like a misfit, Johnny Marr coated in it whimsical, jolly tunes. Not much is known about him because he left no letters and documents, so it’s hard to explain why he painted what he painted. I believe his cityscapes weren’t painted to symbolise urban isolation and loneliness, but rather served to indulge his love for painting light which is present in all his paintings, whether it’s the street lamps, the moonlight, light from the carriages or the shops, he was simply fascinated with it. The introduction of gas lamps was surely a life-changing moment for many.